Our second store in Hatton Garden is the perfect place to go if you're looking to buy an engagement ring in London. If you're buying an engagement ring in London, then there is only one place to go. Hatton Garden is London's very own Jewellery Quarter, with rows of shop windows boasting dazzling diamonds, glorious gems and magnificent metals. Hatton Garden is an incredible destination in its own right, and deserves a visit. If you're thinking about where to buy an engagement ring in London, we've answered a few questionsto help you, so that you can get the best value for money. Where to buy an engagement ring in London. It's no secret that London is inundated with shops and boutiques full of earrings, engagement rings and so much more. When it comes to purchasing an engagement ring, you need to choose where you're going to get it from. There are the classic High Street chains who offer cheaper prices, but the quality of the diamonds and/or gemstones may reflect this. When you choose to shop in Hatton Garden, London, you'll have a jeweller helping you, rather than a shop assistant. An engagement ring is an investment, so the seller should have an education in diamonds and jewellery. Our second Diamond Heaven store in Hatton Garden offers exemplary service, and a team of experienced, caring and friendly jewellers. What makes us stand out from the rest is the fact that our jewellers offer an array of services, including, polishing, repairing, resizing and so much more. How much should I spend on the engagement ring in London? When it comes to shopping for that all important engagement ring, one of the most common questions is the cost. The De Beers myth states that you should spend between one to three months wages on an engagement ring, and the average spend on an engagement ring is around £1,650 in the UK. We'll let you in on a secret... the amount you should spend on an engagement ring is entirely up to you. Oh, and we thought we'd mention that just because you're buying your engagement ring from London, doesn't mean it will cost twice as much as a similar ring purchased in Birmingham or Manchester. Whilst the average spend on an engagement ring in London is around £4,700 , it doesn't mean you have to spend that much. How do I find out my partner's ring size? If you're proposing with an engagement ring, then you'll want to get the sizing right. As soon as you've got down on one knee and present the box, your partner won't want to take the engagement ring off. Our jewellers in our Hatton Garden store recommend that you borrow (sneakily of course) a ring that your boyfriend/girlfriend already wears on the ring finger and then bring it in! We can then tell you what ring size your partner is. Don't worry if your chosen ring isn't the perfect fit - our team of skilled jewellers can resize the ring for you. Unless it is a vintage or overly complicated engagement ring, of course. Check out our sizing guide here. How do I find a ring my Partner will like? You're thinking about proposing to your partner, so you probably know what they like and dislike. If you're unsure of what style, metal, or shape of engagement ring to go for and what to surprise your boyfriend or girlfriend, then ask their family or friends. You have to place trust that they'll be able to keep it quiet though! Another way to pick an engagement ring your partner will like is by bringing pieces of existing jewellery into our Hatton Garden store, for our jewellers to see. They can they help you find the perfect engagement ring for your beau . It also means the ring you pick out will complement their existing jewellery, which is always a bonus! Can I only get diamond engagement rings in London? Whilst diamonds are a girl's best friend, not everybody wants a diamond engagement ring (it hurts us to admit this). However, you can choose many other precious jewels for your beau's engagement ring if they're not dazzled by diamonds. Many jewellers in London (including our Hatton Garden store) offer some phenomenal gemstone engagement rings , boasting sapphires, rubies and so much more. Some of our favourite engagement rings feature both gemstones and diamonds, surrounded by white gold. 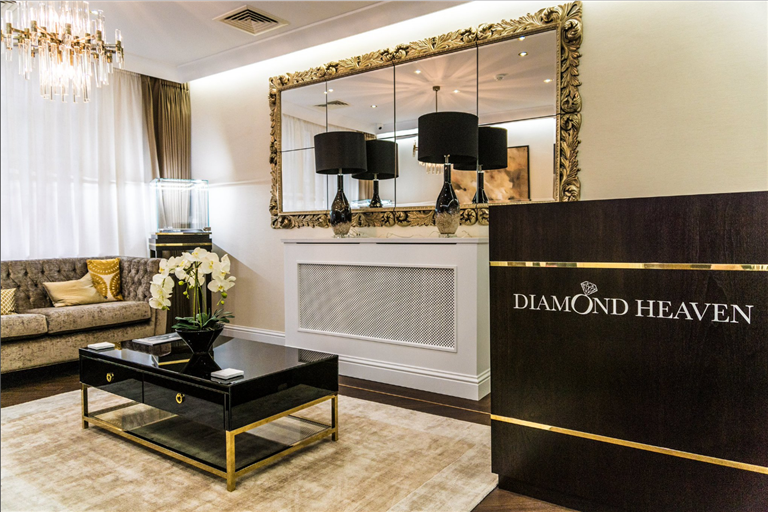 Now you know where to buy an engagement ring in London (at Diamond Heaven of course! ), Download our proposal guide and make sure you're prepared.